A quiet street and still the hustle and bustle just around the corner? Completely new furnished cottage with cozy sleeping loft. 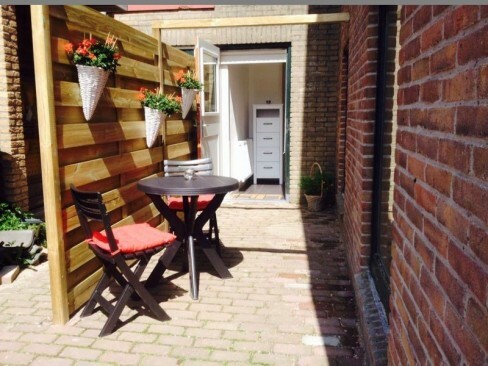 This new furnished holiday cottage (40 m²) is perfectly situated in a quiet street. The beach, the dunes and also the shopping streets are right on your doorstep! Entering the cottage through your own frontdoor you reach the living area, which is fresh with tight stucco work and an attractive white beamed ceiling. There is a hall where you can find a shower and a toilet. Through the window you have a view over the owner´s garden, who lives in the property nextdoor. The living area is simple but provides everything you need; a comfortable 3-seater sofa from where you can watch television or movies (flat screen TV) and a coffee table. WiFi available. The open kitchen is equipped to prepare full meals: a gas stove, an extra worktop, a fridge and enough kitchen utensils are available (more details under features). The dining table gives place to two persons. The sleeping loft can be reached through a solid wooden staircase from the living room. This is a bright, semi-open space with a double bed (1.60 m x 2.00 m). The two skylights ensure that you can fall asleep under the stars. The drawers under the bed, as well as the separate commode provide enough storage space. Outside: next to the frontdoor, there is a garden set. Here you can relax and enjoy the sun with a drink! You can park your car for just € 5,- a day in the parking lot "De Zuid", a few minutes walk from the house. Schöne Wohnung. Gute Lage in der Nähe der Mittelposition. Questions about Zomerhuisje La Vie 287?